Syria was also called Aram, which as you can see is just north of the Kingdom of Israel. It was a natural alliance, geographically. Syria became attached to the great Assyrian Empire, and gave Israel a whole lot of trouble over time. Israel was in no better shape, spiritually, than Judah and Jerusalem were. Israel was ready to make alliances with ungodly kings in order to move against Judah, against whom there was often a lively hatred. 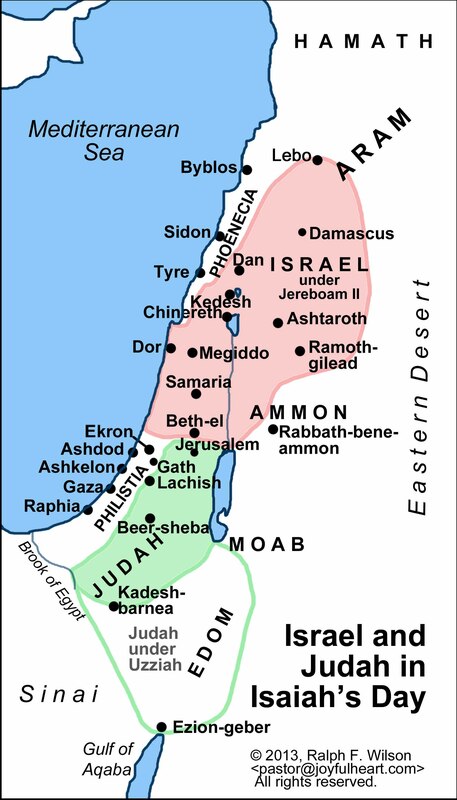 This attempted invasion took place after Uzziah died, during the reign of his grandson Ahaz. Isaiah was given no written prophecy to record at this time. Jotham, son of Uzziah and father of Ahaz, seems to have been inclined to conforming to God’s Law, but there was much evil in the nation, and the next king, Ahaz, was in open rebellion against God. Judah was soon to come under the direct enacting of Isaiah’s prophecies against her. The two kings who led armies against Judah, then, were Rezin, King of Syria (Aram) and Pekah, son of Remaliah, King of Israel. You can read about this period of time in II Chronicles 27, to help you get a clearer picture.